The World, According To Me: Utah for Obama Meeting Tomorrow! 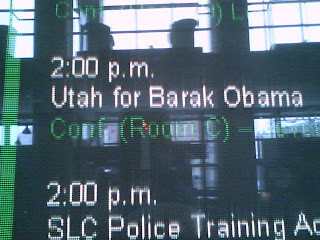 Utah for Obama Meeting Tomorrow! The second meeting for Obama Supporters from Utah will be held at 2:00 PM Saturday, March 3, at the Downtown Salt Lake City Library (210 East 400 South) in Conference Room C (Level -1). o We need a volunteer to coordinate this effort. * What do we, as a group, hope to accomplish? For more on Utah for Obama, please visit UtahForObama.com.